Below are some of the stories told by Bill Downs during his time reporting from Moscow in 1943. They include accounts from Stalingrad and Kharkov. Parentheses indicate portions that did not pass Soviet censors for military security or propaganda reasons. (For more, see the complete 1943 Moscow reports. The New York Times also published a story in 1945 entitled "First-Hand Report on the German Soldier"). The war that is being fought in Russia tonight (while being the most terrible and devastating conflict in military history) is in many ways like any other war. The viewpoint of the ordinary Russian private towards the fighting around Kursk and Kharkov and Rostov tonight is much the same as any American soldier. The soldiers with whom I spoke in Stalingrad (last Sunday had the soldier's avid interest in food, in women, in getting leave, and seeing his side win, as any buck private in the rear ranks of the United States Army. The Russian private doesn't) don't like the idea of dying any more or less than any other soldier—and consequently they don't talk too much about it. (You talk to them about their battle experiences, and like all good soldiers they don't say a word about their own exploits.) To hear them talk, the tremendous Battle of Stalingrad is merely a collection of little incidents which finally ended up in a German defeat. At one point in the Stalingrad line, the German and Russian soldiers used to amuse themselves by shouting insults back and forth to each other. My Russian friend said that one German soldier shouted across the lines and offered to exchange his automatic rifle for a Red Army fur cap. I asked the Russian soldier what his answer was. "Oh, I answered all right," he said. "I told them to bring along a tank and I would bargain with them." Then there was the time near the end of the Stalingrad fighting when the Germans were very, very hungry. Only a month before, the Germans had been razzing the Soviet forces, saying the end of the Red Army was in sight. Now the situation was reversed and the Russian soldiers devised their own fun. To show starving German troops how well Soviet kitchens were working, they put whole loaves of bread on the ends of their bayonets and stuck them above the trenches. The German answer was to riddle those loaves of bread with Tommy gun bullets. These are the stories which will mark themselves in the minds of ordinary soldiers. Certain Red Army units have started their own spring offensives in a war of nerves that has had some pretty ridiculous results. Here's what happened a few weeks ago on one sector of the front. The Red Army unit dug into this sector has been fighting the Germans for a long time. They were fairly familiar with a crack German regiment opposite them. It was a regiment of the Waffen-SS, Hitler's personal troops. One night a group of soldiers went out on a strategic clearing that formed the no-man's-land between the two trenches and put up two poles. Between these two poles they stretched a canvas cartoon of Hitler—it was not complimentary to the Führer. Under the cartoon was written in German in large letters: "Shoot at me." Then the unit waited until morning to see what would happen. When the sun rose, they could hear loud discussions in the German trenches. Staff officers came to the trenches and had a look at the insulting cartoon through binoculars. But the Germans refused to obey the instructions to shoot at their own leader. Before noon they opened an offensive to capture the cartoon. A detail of German soldiers was ordered to take the canvas down. This detail almost reached the cartoon of Hitler before they were wiped out. Another detail was sent. It too failed to get the cartoon. And then in the evening, German artillery all along the sector opened up on the Führer. All the German guns were concentrated on the spot. It took a fifteen minute concentrated barrage before the cartoon was blasted out of existence—which is one way of killing a dictator. And any time you want, you can find Russians who will argue that there is not going to be a second front this year and why. Other Russians will argue just as violently that there will be a second front. It's a favorite way of passing the time here. But the feeling of the ordinary soldier is best expressed in a story from the front that I heard the other day. The Red Army men are getting a lot of American canned meat, and they like it. However, they don't call it canned meat. When they get hungry, they say: "Come on Ivan, let's open up a can of that Second Front." ...Most Soviet factories I have seen seem to have the same high walls. On a plane, I met a Russian-speaking man from a tourist agency and asked him, "How do you tell prison from factory in this country?" We landed at Kuybyshev in a blizzard, where I was forced to get along on my own speaking Russian. I walked into the airport waiting room and saw Russian soldiers sitting around while a chess game progressed in one corner. Someone brought me a cup of tea—I had no Russian money and don't know who paid for it. The atmosphere about this place had the same sort of isolated comradeship you find in old-time village grocery stores. All it needed was a cracker-barrel and a potbellied stove. Finally an army captain approached me without smiling and asked, "Sprechen sie Deutsch?" I didn't know whether to say yes or no, since I am able to speak a sort of pidgin German from my college days. I looked around the room, which had sort of frozen up when it heard German, and I was the only foreigner around. I decided to chance it and replied, "Ja, aber ich bin Amerikanischer korrespondent." The room roared in laughter and I was immediately offered a flask. I was expecting vodka, which I already knew all about. I prepared to show what healthy drinking men Americans were and took a big mouthful. As a result I about blew the top of my head off; the captain had given me a flask full of raw 190 proof alcohol that tasted as if it had recently come from an automobile radiator. Again the room roared in laughter. Soldiers came up and we shook hands. With the aid of my Russian dictionary, I discovered that most of the men just came from Stalingrad. They said that American and British tanks fought in that battle. I asked the Russians how they liked the American tanks, a question answered amid exclamations of "khorosho, khorosho" which, according to my dictionary, means damn good. Then the Russian captain took the dictionary from me and began looking up words after repeating a sentence which I couldn't understand. The first word he pointed out translated to "we." Turning pages, the captain pointed out another word: "want." Ruffling the pages some more, he pointed out another Russian word which meant "more." I grinned and told him I understood the rest. The Russians in the room smiled very seriously and said "da, da, da, khorosho." For sleeping arrangements I volunteered to sleep on the floor like everyone else because the blizzard made it impossible to get into the city. However, the captain insisted I go to the airport hotel, which is kept mostly by Soviet airmen. Offering me the best bed in the house, I found it a bare room with six other beds jammed in. The captain stuck around, much to my relief, and took me to a dance with young Red Army pilots. The pilots were dancing with girls ranging from young to old to a cracked recording of Tommy Dorsey's "Marie." It is evidently the favorite of this post, because it was played over and over. I picked out the best looking gal in the house and found out she danced better than most English girls in London as well as the average girl in the United States. I paid her a lot of compliments which she didn't understand, but I didn't have the chance to get anywhere because a large, tough boy, wearing the medal of the Hero of the Soviet Union which he got at Kalinin, took her back like the Red Army takes inhabited points. I was kept awake in my crowded hotel room, partly by snores and partly by the same feeling I had been here before. These people were trotting out their best for me, exceedingly interested in news of the outside world. I continued on to Gorky in an extremely cold Russian troop carrier—another Douglas—which was jammed with officers going to Moscow and various types of cargo, including huge bales of wool for uniforms. This Douglas had about twenty patches on her. The plane had seen action, but the pilot wouldn't tell me where. In Gorky I added another word to my vocabulary. I billeted with the Douglas crew, all youngsters. We got into a dictionary conversation about American planes; the first mention of them drew exclamations of "ochen khorosho." It was funny to hear airmen talk in authoritative Russian tones about Lockheed Electras, Airacobras, and Bostons, and discuss the merits and faults of tricycle landing gear. They knew more about them than I did. I got my first glimpse of what it means when people in Russia say "everything for the Red Army." These airmen had clean, neat rooms and soft beds, and they ate in a separate room where such rarities as butter were served. They looked healthy and tough, about the same as our own airmen. Their equipment was tremendous, with good heavy clothing and fancy gloves. They wore great oversized boots lined both inside and out with fur. One rear gunner was very proud of his because they were made from the hide of a dog he used to own. Typical of the daring, devil-may-care spirit of these new Red Army forces was the almost comic capture of Field Marshal Von Paulus. Von Paulus, the only German field marshal ever to be made a prisoner of war, was taken after initial negotiations conducted by a 21-year-old Red Army first lieutenant. He is Fyodor Yelchenko, a Ukrainian kid with a grin a mile wide. I talked with Senior Lieutenant Yelchenko in the narrow, bare room where Von Paulus had his headquarters in the basement of Stalingrad's biggest department store. Only the basement of this big five-story building was intact. 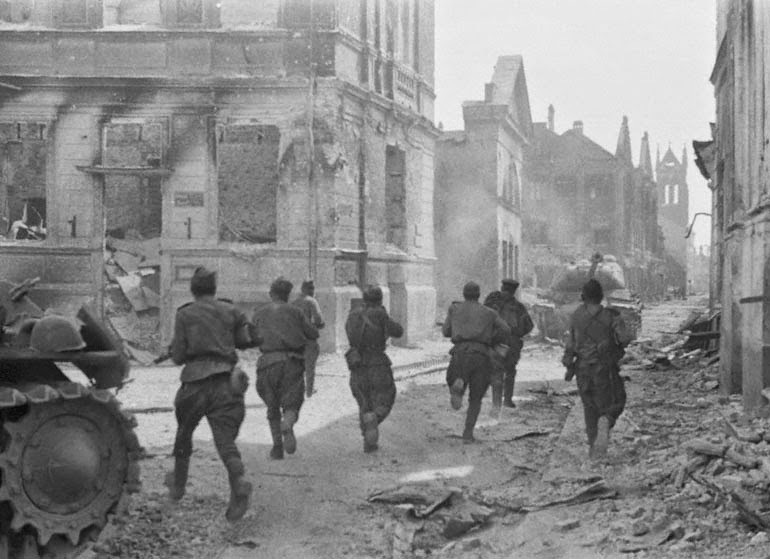 Yelchenko was leading a group of fifteen Tommy gunners (which were part of a force which surrounded) against the German Sixth Army headquarters. The lieutenant (who grinned all the time as he told the story) said that, after the initial artillery barrage on the headquarters, a delegation of German soldiers carrying a white flag approached his group. "They said they wanted to talk with a Russian big chief who would talk with me," the lieutenant said. "I was the officer in command so I went along. Since Germans are still Germans, I took along two men. The guards led me (through the minefields protecting the building, and I went) into the basement. There, Major General Roske and Lieutenant General Schmidt stood at the table. Von Paulus was lying on a narrow iron bed in another room. They asked what were our terms, and told them they were complete surrender as outlined by our command several days earlier. Schmidt kept running back and forth to Von Paulus as we talked. "Then they asked if I wanted to see Field Marshal Paulus and ask him any questions. We had settled all the questions, but I had a look at him anyway. He was lying on his bed looking very sad, and he needed a shave, but he wore all his decorations." Fyodor Yelchenko, a farm boy from Ukraine, is typical of the "Soviet men of decision" who are pledged to clear Russia of fascists. The military spring training on the Russian front seems to be just about over. Nothing of importance happened along the 1,200 mile front last night. There was the usual artillery barrages—Soviet aircraft made their regular trips to railroad junctions and supply points behind the German lines; snipers on a half-dozen sectors put a few more notches in their guns; and scouts succeeded in slipping through the Axis lines on their hell-raising missions in the enemy rear. During this spring lull we've heard a lot about the achievements of these Russian scouts. They are the modern Russian counterparts of "Buffalo Bill" Cody and Kit Carson and others who formed the vanguard in America's winning of the west. Except the work of a modern scout in the Soviet Union is a lot more complicated. For example, take the Red Army scout Yakov Chekarkov, a 30-year-old bachelor who used to be a storekeeper at a tractor station in one of Russia's big collective farms. Chekarkov knows his stuff. His job is to creep as close to the German lines as possible and find out just what the Nazis are up to. There are thousands of these men who creep out every day and night to gather information. Sometimes they go deep behind the German lines, and sometimes groups of them do commando raids. Chekarkov has introduced his own methods. For example, he watched the Germans lay a minefield on the approaches to a forest. At night he took his own mines and mined the passages which the Germans left through the field. You can imagine what happened when the Germans attacked. This scout also has become an expert on German uniforms. He spotted tank reinforcements in one sector because he noticed the pink tabs on the collars of some of the men who were designated tank troops. This winter he sat for days in the frozen carcass of a dead horse just in front of the German lines. Another time he found a hollow stump almost inside the German fortifications. He established his position by burrowing under the snow and cutting his way inside the stump from the bottom. It takes a lot of courage to be a scout in Russia, and Yakov Chekarkov is a brave man. However, he has one great fear: catching cold. He was scared to death by a cold last fall. He was behind the German lines when he sneezed. He had to run for his life. Now he never does any scouting without a heavy wool shawl wrapped around him like an old woman. Today we have the story of a Ukrainian Robin Hood who is now giving the occupation authorities more trouble than any guerrilla leader that has yet appeared in Russia. He is called "Bogdan the Elusive"—and he heads one of the biggest partisan armies in Russia. His record of train wreckings, executions of German burgomeisters, and picking off of isolated Romanian and German garrisons is still being added up. But his reputation is known throughout the Ukraine—more by the Germans than by the Russians. German punitive expeditions have tried time and again to capture him. But when Bogdan is reported in one town, the police troops will arrive only to find the German mayor of the town hanging from the nearest beach tree, and a note saying "I'll be back" signed "Bogdan." Early this year his partisan band even made an attack on the outskirts of Kiev in western Ukraine. It was just a sortie, and nothing came of it except a lot of Germans were killed. But his spies infiltrated into the city and brought back reports of how the Germans were running gambling halls and vice establishments all over Russia's most beautiful city—and it made Bogdan mad. So he decided to conduct the sortie. Life in Kiev was a lot more sober for several weeks afterward. Once, the Germans thought they had Bogdan. They carefully threw a cordon around his camp. When they finally closed in on the camp they found warm campfires, empty tin cans—and a goat. Around the neck of the goat was a note saying "A hurried good-bye—but I'll be back." Since that time several other goats have been found wandering the Ukrainian steppe-land—all with notes from Bogdan around their necks. Now the goat has become a sign of bad luck among the Germans—they hate the very sight of the animal. One of the biggest surprises I've had here in Russia was my experience yesterday with a history class of 14-year-old boys at a Moscow public school. So I decided I would beat them to the draw. I asked the class just how and where they thought a second front should be started. Those kids (put up their hands to express their own pet theories) had as many theories (—well you might have thought it) as the combined general staff (meeting) in Washington. The reaction was terrific. (There was considerable agreement to this reasoning). And then up stepped the boy who obviously was a grade-A student. He wore thick glasses and his ears that morning seemed to have escaped his mother's inspection. But he was a leading figure in that history class. You could tell by the way the other boys shut up when he talked. His named was Felix. Felix was all for an advance through the Balkans. He explained that (the position of Turkey had been stabilized and said that) the Balkans were definitely Hitler's back door. There would be, according to Felix, much help from the Balkan population. And after this landing, the invading troops could join up with the Red Army and clean up Europe from the East. After that, I thought the discussion was ended and that I was going to escape without getting asked any questions. However it came anyway. "When is the second front going to start?" I told the history class I didn't know—but I promised I would pass along their second front strategy to the United States. So there you are—the report on military tactics from the seventh grade history class of Public School Number 175 in Moscow. Alyosha was raising a pet pig named Khrushka when the Germans came to the village. He loved his friend Khrushka and was very much afraid when the Germans started collecting all of the other pigs and cows and chickens in the village to send back to Germany. The Germans finally went away. When Alyosha went to get Khrushka, he found that the pig was dead. You see, peasant stoves are very hot during the Russian winter and Khrushka had suffocated. Alyosha was very sad and wanted to give his friend Khrushka a fitting burial. (However, he was afraid that the Germans might kill him if they found him with the body of Khrushka after he had lied to them.) So Alyosha got another boy in his village and dug a grave by the side of the road. At night, they carried Khrushka to the grave and carefully buried the pig. However, both of the boys knew that Germans are very careful about freshly turned earth—they are always looking for hidden parachutes or arms or valuables when they see that something has been buried. So Alyosha made a rough cross and got a German helmet. On the cross he carefully copied the first German name he could remember. It was Schmidt—or Schwartz—something like that. Alyosha put the cross at the head of his pet pig's grave and placed the German helmet on top of the cross. It looked just like a score of other German roadside graves that dotted the area. Then the German headquarters moved to the village. The German general stopped to examine the grave and gasped when he read the name. It was the same name as the general's son, who was missing on the front. The general immediately called his officers and demanded that his son be buried with more honor. He ordered the body be disinterred. This story ends with the sweating officers digging out the grave, with the German general standing bravely aside, waiting to view the last remains of his son. No one stayed long enough to see what happened when the general discovered that his "son" was the prize pig Khrushka. Right now, the big events in Russia are occurring behind, and not at, the front. (The area was cleared and) a Red Army lieutenant (started looking for the mine. He) sounded the walls, the floor, and even the ceiling of the house. Still he could not locate the hidden explosives. He was just about to give up when he heard cats meowing in the stove. He opened up the door and one cat jumped out. The second cat just started to leave the stove when the lieutenant pushed it back inside. On investigation, he found that the second cat had a string attached to one of its rear paws. The other end of the string was attached to the fuse in 25 pounds of high explosive. It was another of those cute Nazi ideas that didn't work. The Red Army railroad battalion has achieved something of an engineering miracle. In a little over two weeks they have succeeded in opening the vital Moscow-to-Velikiye Luki trunk railroad. The first military train moved over this railroad yesterday. The repair of this stretch of 280 miles of railroad was one of the most difficult assignments any engineering corps has ever had. The railroad has been the center of a battlefield since the early days of the German invasion. It has been bombed by both German and Russian planes. 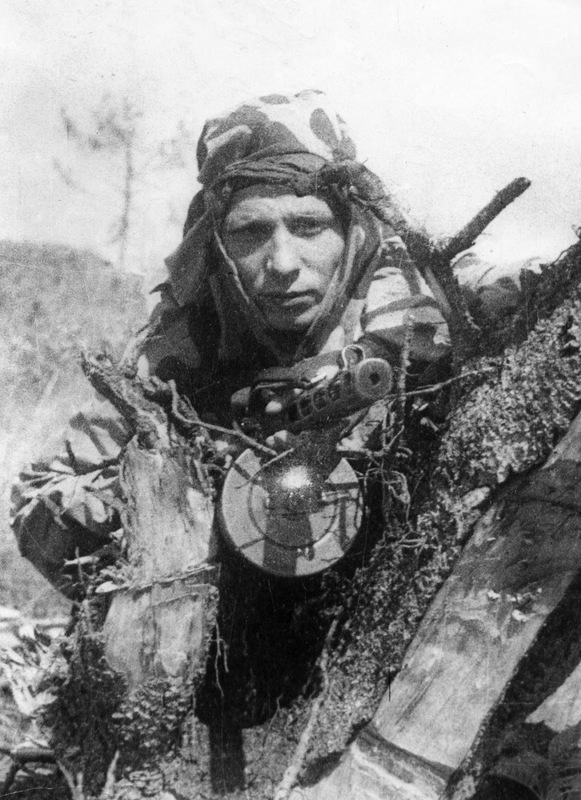 Soviet partisans have blown it sky high at a hundred places during the period when the Germans held the line. And when the Germans were chased from the area, they did one of their most complete jobs of earth scorching along the Velikiye Luki-Moscow railroad. Every bridge was blown up. Switches and sidings were destroyed. In some places the Germans even burned the forest around some vital bridges so that the Russian engineers would have no material with which to reconstruct them. But even before Velikiye Luki was taken, the Red Army railroad corps went to work. They found that, in addition to widening the gauge of the railroad tracks, they would have to virtually reset every rail. You see, the Germans not only destroyed all switches, they also sent men along the lines with heavy sledgehammers who every fifty feet or so just knocked a piece of rail out. I have seen this type of destruction in every place where the German Army passed. Consequently, the railroad corps had to saw and chisel these broken rail ends so that they could be joined together. At first, the repair gangs could only repair fifty of these rails a day. Before the job was finished, they were repairing 250 a day. Each gang—and there were four big corps working on the railroad—succeeded in relaying something like four to six miles of railroad a day. When a job was particularly difficult, the civilians in the neighborhood were called in to give a hand. You probably couldn't run an American streamliner at a speed of a hundred miles an hour over the reconstructed Velikiye Luki-Moscow railroad line today. But you can job along at twenty to thirty miles an hour with heavy freight and munitions and arms. And that's what's happening today as the Soviet command reinforces its Velikiye Luki garrison—the garrison which is closer to the borders of the Soviet Union than any other group pushed to the east by the Nazi invaders. The first independently led and organized units of the Czechoslovak army to fight the Germans in this war went into action the other day somewhere on the Russian front. The men of this army, refugees from their homeland, lived up to every standard of courage and honor that has made Czechoslovakia one of the proudest of Europe's small nations. The story is worth reporting. At the first of April, the Czechs were thrown into the front line—probably somewhere on the Donets front. Their sector was of big importance. The Germans launched a counterattack. It was a big show, and sixty tanks appeared on one narrow sector opposite the dug-in Czech troops. A young lieutenant named Yarosh was in command on this sector. 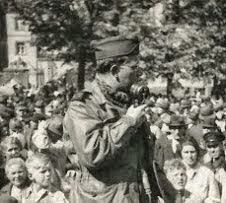 His field telephone rang, and Colonel Svoboda said the unit would have to hold out alone. There were no reinforcements to help the lieutenant stop the sixty tanks. The colonel's orders were "It is impossible to retreat." Approaching the Czechs behind the tanks came the German infantry with Tommy guns. While the Czech machine gunners kept the German infantry on the ground, other Czech soldiers continued the battle against the tanks with incendiary bottles. But during the battle Lieutenant Yarosh was killed. He was crushed under a German tank thinking he might be able to stop it at the last moment. That's the first story of the Czech army in Russia. The official communiqué commemorating the event read: "The men of the Czech unit (during the whole day and night) self-sacrificingly waged fights against the enemy and repelled all attacks. As a result of this fighting, nineteen German tanks were disabled and burned, and four hundred German Tommy gunners annihilated." The German troops in Russia form the lousiest army in the world. I mean that literally. The one thing about them that really shocks the Russian fighting man is the number of lice on the average captured German soldier. This condition was particularly bad during the Russian winter. 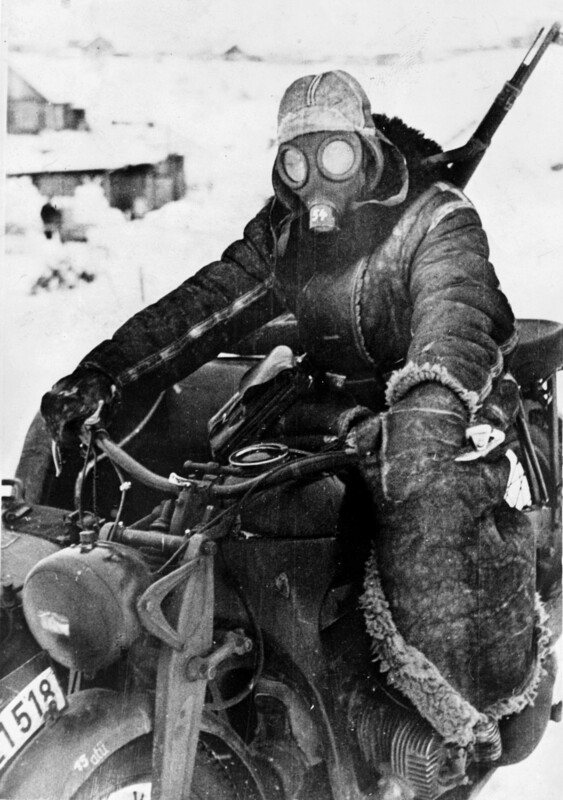 One of the big differences between the Red Army and Hitler's Wehrmacht is that the Russian soldier knows how to keep clean and still protect himself from the cold. The ordinary German soldier is so busy keeping from (getting killed here in the Soviet Union) dying that he doesn't bother too much about personal hygiene. Consequently, he gets lousy. But seriously, the (Russian) louse has turned out to be a very valuable ally to the United Nations. The German troops have run on to typhus in this country, and it has been a problem for the Nazi medical corps. And a soldier can't keep his mind on fighting if he's busy scratching. ...Thousands of men, women, and children marched out to Lukyanovka, thinking they probably would be evacuated. Instead, Nazi SS troops led them to Babii Yar. At the wide shallow ravine, their valuables and part of their clothing were removed and heaped into a big pile. Then groups of these people were led into a neighboring deep ravine where they were machine-gunned. When bodies covered the ground in more or less of a layer, SS men scraped sand down from the ravine walls to cover them. Then the shooting would continue. The Nazis, we were told, worked three days doing the job. However, even more incredible were the actions taken by the Nazis between Aug. 19 and Sept. 28 last. Vilkis said that in the middle of August the SS mobilized a party of 100 Russian war prisoners, who were taken to the ravines. On Aug. 19 these men were ordered to disinter all the bodies in the ravine. The Germans meanwhile took a party to a nearby Jewish cemetery whence marble headstones were brought to Babii Yar to form the foundation of a huge funeral pyre. Atop the stones were piled a layer of wood and then a layer of bodies, and so on until the pyre was as high as a two-story house. Vilkis said that approximately 1,500 bodies were burned in each operation of the furnace and each funeral pyre took two nights and one day to burn completely. The cremation went on for 40 days, and then the prisoners, who by this time included 341 men, were ordered to build another furnace. Since this was the last furnace and there were no more bodies, the prisoners decided it was for them. They made a break but only a dozen out of more than 200 survived the bullets of the Nazi Tommy guns.